1960: There were 6 new fashions that came out this year. 1961: There were 8 new fashions new this year. 1962: There were 8 new fashions that came out this year. Orange Blossom came with short white gloves in 1961-62 and long white gloves in 1963-64. Also sew your own fashions arrived this year. 1959: There were 23 fashions that came out this year. Only 3 of the outfits were discontinued after 1959, which makes them very rare and very sought after: Gay Parisienne, Easter Parade, and Roman Holiday. #983 Enchanted Evening had a rabbit fur stole and either a fabric rose or 3 sequins with three bead accents at the waist. 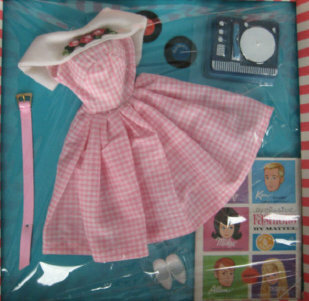 The early outfits included shoes for the first Barbie Doll which had the holes in the bottom to fit her stand. The first Barbie label in the clothing was black and white and read: Barbie™. The label was later changed to read Barbie ®.